This baked ziti with chicken is so easy, versatile, and delicious. It’s one of my family’s favorite casseroles and I love how quickly I can throw it together, or just pull it out of the freezer. You and your family will definitely enjoy this one and for a meatless version, try our easy baked ziti recipe. For other great baked pasta dishes, try our baked spaghetti or our easy lasagna casserole. They are both great options for potlucks, family dinners or parties. I love making casseroles during the weeknights, when everyone is busy with school, work, and activities. They ensure that we can all sit down for a delicious family meal, even if it is just a quick one. 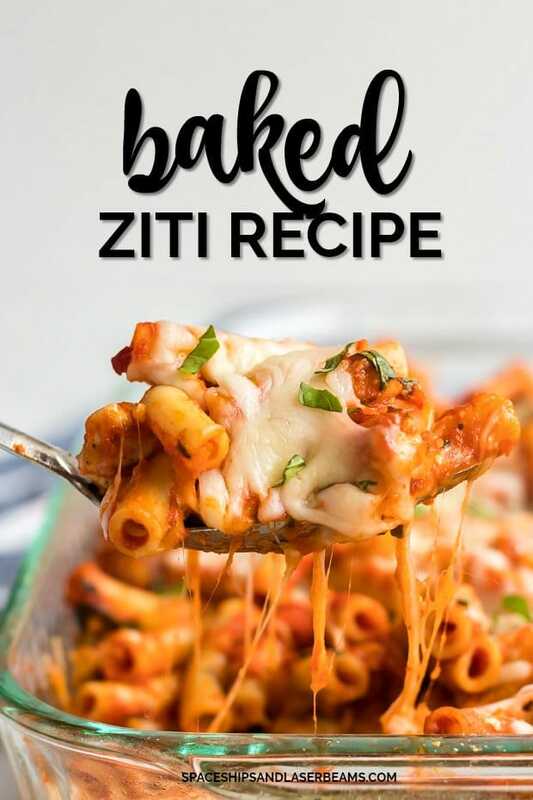 I am a sucker for any sort of pasta dish, but I especially love the cheesiness of this ziti pasta dish. It’s very versatile. The addition of chicken is delicious and gives it protein. Typically with pasta dishes I use hamburger, so it’s nice to switch it up and use chicken in this one. As you’ll see in the recipe below, I make it with tomato and basil pasta sauce. But, you can use any kind of pasta sauce. Choose whatever is your (and your family’s) favorite! You can also use Alfredo sauce — it’s also really tasty! Or do a mix of marinara and Alfredo sauce if you’re a pink sauce fan. First, preheat the oven to 350 degrees F. Next, prepare a 9×13 baking dish by spraying it with cooking spray. Then, cook your ziti pasta to al dente, drain it well and return the pasta to the pan. Prepare the uncooked chicken by generously seasoning it with salt and pepper. Then, heat the olive oil in a medium skillet over medium heat. Add your chicken and cook it until the chicken is no longer pink in the middle. When the chicken is done, add the 2 cloves of minced garlic to the skillet and cook for another 30-60 seconds, or until the garlic is fragrant. Next, stir the sauce, chicken, and basil in to your pasta in the pan, making sure everything is evenly coated. Pour half of your pasta mixture in to the prepared baking dish. Top the first half with 1/2 cup parmesan and 1 cup mozzarella. Then, pour remaining pasta mixture on top. Don’t add the rest of the cheese quite yet! Now you will want to cover the pasta casserole with aluminum foil and bake it for 20 minutes. After 20 minutes, uncover the dish and top it with the remaining 1/2 cup parmesan and 1 cup mozzarella. Then, bake, uncovered for another 8 minutes. 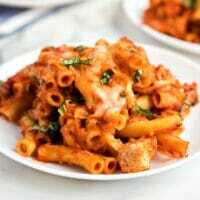 When finished you can top the ziti bake with additional chopped basil, if desired. 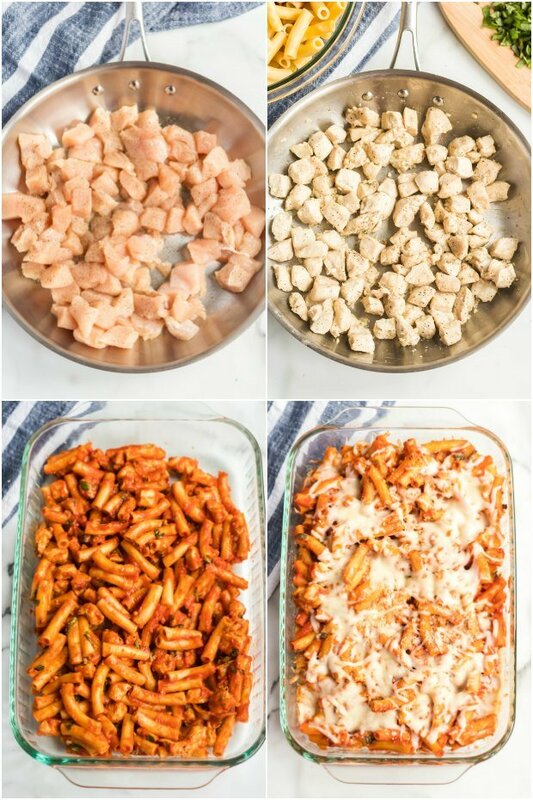 The cooking for your baked ziti with chicken is done in three steps. The first step is cooking the pasta. You want to cook your pasta to al dente. That way when it cooks again in the oven it won’t get too soft and soggy. Step two, comes after putting the casserole together. You will bake the entire ziti dish for 20 minutes. Make sure that you cover the pan with aluminum foil for this step of baking. Then, for step 3 you will remove it from the oven and put on the rest of the cheese and bake it again for about 8 minutes to finish baking and melt the cheese. For this step you will bake the dish uncovered! I usually serve a big, fresh side salad with this dish. It’s perfect for adding in veggies and greens, and I think a salad is always a nice compliment to a pasta dish. I like to leave my salad undressed and let each person choose their dressing! We can’t have pasta without mentioning bread, can we? I love to have garlic toast or a baguette of some kind with this dish. If I’m honest, I think I get just as excited about garlic bread as I do about the pasta itself! Anyone else with me on that one? YES! That is another reason why I absolutely love baked ziti with chicken. 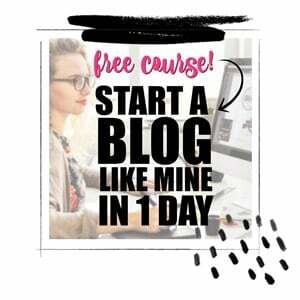 It freezes so well and makes it very easy to have on a later date. The most important aspect of freezing this dish is to make sure that it has completely cooled down before putting it in the freezer. Leave them sitting out at room temperature for about a half hour. Then, cover them with foil and throw them in the freezer! They are best if eaten in about 3 months time. Reheating is easy with this one as well. You can put it in the oven for an hour, covered and then uncover and bake for another 10 minutes. Cowboy Casserole— a favorite for kids! Oven Beef Stew – made in a baking pan!!! 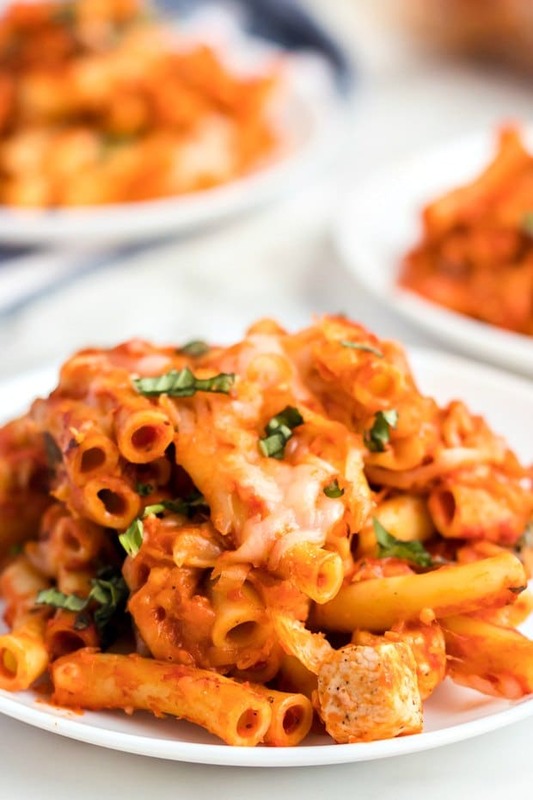 This baked ziti with chicken recipe is an easy to put together pasta casserole that the whole family can enjoy! Heat olive oil in medium skillet over medium heat. Add chicken and cook until the chicken is no longer pink in the middle. When the chicken is done, add two cloves of minced garlic to the skillet and cook another minute, until the garlic is fragrant. Stir sauce, chicken, and basil into your pasta, making sure everything is evenly coated. Pour half of your pasta mixture into the baking dish. Top with 1/2 cup parmesan and 1 cup mozzarella. Pour remaining pasta on top. Cover with aluminum foil and bake 20 minutes. Uncover, top with 1/2 cup parmesan and 1 cup mozzarella and bake, uncovered for 8 minutes. Top with additional chopped basil, if desired. This looks so good – such an easy, delicious family dinner!